The “National Youth Conference 2019” promises to make youths aware of the current scenario of opportunities in their country by addressing them in five major thematic areas; Sustainable Development Goals (SDGs), Youth Leadership, 50 under 50 (Gender Equality), Youth Entrepreneurship, and Tourism (Visit Nepal 2020). The National Youth Conferences in the past years has created history by providing correct guidelines to the youths, facilitating them with enough knowledge and networks, nurturing leadership qualities in them in order to start entrepreneurship. Additionally, Nepal Youth Council has been notably practicing gender equality and sticks its importance in the mind of youths from time to time as both the parties carry an equal part for the prosperity of the nation. Today, youths comprise 40% of the world’s population. This is a sizable number that holds promise for driving the economic development of the country as they represent a vital resource for the transformation of any nation. In Nepal, out of the total population of more than 29 million, youths between the ages of 16 - 40 constitute 40%. Nevertheless, half of the youth population is either unemployed or underemployed. In twenty years’ time, they will become old. 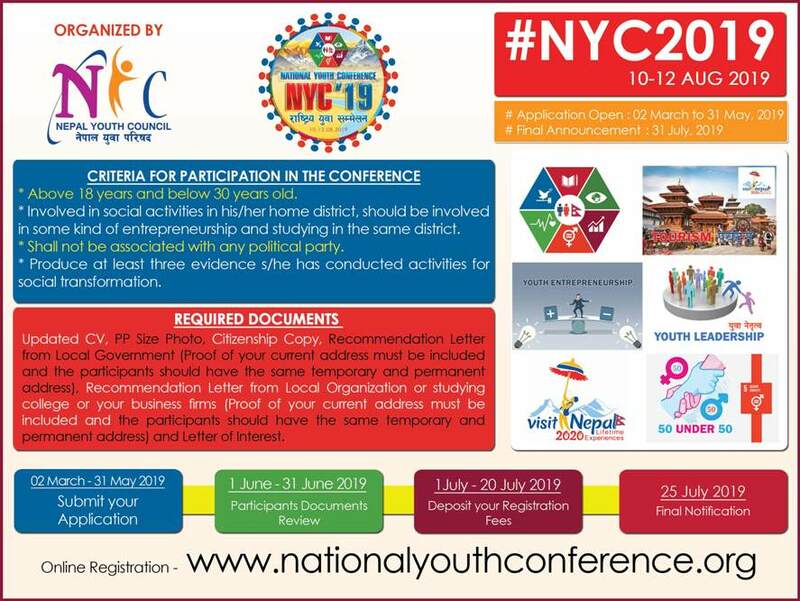 In recognition of the fact that they play determining roles and to bring that undeniably effective force into the mainstream of development in Nepal, the Nepal Youth Council (NYC) is proposing to host a three-day National Youth Conference 2019 from 10-12 August 2019. To facilitate space for youths for their decision making a role in 3 levels of Government mechanism and improvement in the field of leadership, entrepreneurship, network, and personality development. To empower youth in the field of SDGs, Tourism (Visit Nepal 2020), Youth Entrepreneurship, Youth Leadership and Gender Equality (50 under 50) by outsourcing experts in the relevant fields. To mobilize the youth delegates from 77 districts to plan policies, genuinely beneficial for youths, and persuade federal, provincial and local government to have an impact on local and national policies. 7 Provincial Plans of Action on major workout area of the provinces. 7 dynamic ideas in the five focused areas of the conference. In total, 204 participants will attend the Conference. 144 youths (one female and one male) from 77 districts will be eligible to participate in the Conference. Additionally, 50 youths (gender balanced) will be selected from among the differently-abled, Dalits, diverse ethnic groups and LGBTQ. Above 18 years and below 30 years old. Involved in social activities in his/her home district, should be involved in some kind of entrepreneurship and studying in the same district. Shall not be associated with any political party. Produce at least three evidence s/he has conducted activities for social transformation. In case a district does not have a balanced representation of a female and a male, efforts will be made to identify at least three alternate candidates to ensure equal representation. Click here to apply for National Youth Conference 2019.